Home > About Redundancy > Will Going on Strike Affect My Redundancy? Going on strike can be a stressful and challenging time for employees and employers. 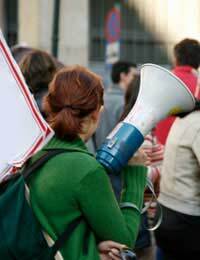 Employees sometimes feel like strike action is a necessary evil so they can get their message across and get better pay and conditions. Strike action often occurs just before an employer makes a large number of redundancies so it is worth knowing where you stand in terms of your legal rights and whether going on strike will have a negative impact on any redundancy payout. These few questions should help you decide whether going on strike is the best decision for you. 1) How Long Have You Been With the Company? 2) Is Your Strike Legal? 3) Was Your Employer Threatening to Sack You Before Strike Action? 4) Is Your Strike Action Going to Come to a Satisfactory End? It sounds like your strike action will have no impact on your redundancy pay. If your employer has agreed that the strike is legal and you have the backing of your union then you should be OK. Even if you were part of a strike a couple of years ago, the chances are that if your employer has not laid you off they are not going to hold it against you now. If you have been at the firm over two years you should be eligible for redundancy pay. Even if your strike action is not successful and you are made redundant straight away your rights should not be affected. If you plan to strike during your redundancy period you should still make sure you do everything above board or you could risk losing your pay. It sounds like there are still some question marks over your strike action and whether this is legal and has been agreed with your union. If your planned strike is going to be while you serve out your redundancy your employer might serve a notice of extension which requests you to work the days that have been lost while you were striking. If you refuse to do this your employer will be able to hold back your redundancy pay. If you have worked at a firm for less than two years though I'm afraid you will not be entitled to redundancy pay even without going on strike. You should also be careful to make sure you give your employer no reason to sack you before you go on strike. If you have already been threatened with termination before the strike action your employer might touch on this reason again and use it against you. From your answers it sounds like your redundancy pay is at risk with or without you going on strike. If you feel strongly about strike action and feel you can achieve good results then you should not let the image of a redundancy package hold you back.Be warned though, if your strike is illegal and you know this is the case then your employer has the right to sack you because you may have broken the terms of your contract. Legitimate strike action by law should not impact your redundancy pay. It is illegal for an employer to sack you because you have taken action. But it should be noted that nay strike action you do take must be legitimate and legal or your employer could have ground for dismissing you which would inevitably result in you forfeiting your redundancy pay. @LOL - I think the best option for you is to speak to someone directly, via the link hereas having redundancy money and if you have additional savings may affect your benefits. I hope this helps.